The US election results delivered a coup de grace to the multilateral trade agreement called the Trans-Pacific Partnership. It was initially championed by the Obama Administration as a key pillar of its pivot to Asia. At first, Japan's Abe was not a proponent, but when he found that it would be helpful is his broader domestic economic reform efforts, he embraced it enthusiastically. Clinton was also opposed to the final draft of TPP. However, among some Japanese officials, there had been ideas that TPP could be transformed into a US-Japan bilateral agreement that could have the new Administration's stamp, set a higher bar which others could join later. However, this Plan B also seems dead in the water. Just as nature abhors a vacuum so does politics. China is no slouch. It has been leading negotiations for a parallel trade agreement called the Regional Comprehensive Economic Partnership Agreement (RCEP), which of course has not gotten much press coverage in the US. Negotiations began in 2013, and there have been almost as many rounds of talks as there were for the TPP. The RCEP includes all the ASEAN countries, Australia, New Zealand, South Korea, India, and China. The TPP's potential members were a bit different. Notably, it included the US and Canada, and several Latin American countries, but excluded China, South Korea, and Thailand. As Capital Economics notes, RCEP countries are the destination of almost 45% of Japan's exports compared with a third accounted for by TPP members. However, Japan already has bilateral free-trade agreements with all the ASEAN members, Australia and India. And, TPP was deeper than RCEP that appears to focus almost exclusively on tariff reduction. Nevertheless, the apparent shift in the US stance requires Japan (and other countries) to re-assess their options. China benefits from what appears to be the likely disengagement of the US. There is an Asia-Pacific Economic Cooperation (APEC) summit this week. It is a perfect forum for President Xi to push ahead with China's strategic counterweight to TPP. Japanese Prime Minister Abe confirmed his intentions to shift the focus from TPP to the RCEP. Xi hoped to wrap things up this year and reach a final agreement, but this may be ambitious. Some countries may want to see if Trump's positions change from the election rhetoric and may drag their feet. RCEP would be a lofty achievement for China, even if it falls shy of the higher bar iof the TPP. It would be the first pan-Asian trade agreement. It would cover nearly a third of the world's GDP and half the world's population. China's plans call for marrying the RCEP to even broader agreement, Free Trade Area of the Asia-Pacific. Like the so-called American isolationist post-WWI, when the US Senate rejected Wilson's proposed League of Nations, many see a Trump foreign policy to be more unilateral than multilateral. 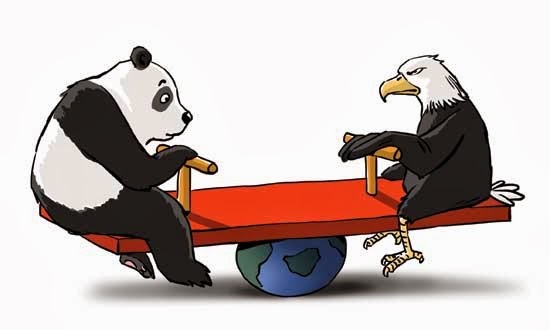 Other countries, like China and Russia, have long chaffed under what they see as US attempt at hegemony, and are looking to move into any space from which the US withdraws. What is at stake is the Great Game, which is what the great power rivalry of the 19th century in Central Asia is called by some historians. Going back to at least the start for the 20th century, the US opposed the traditional spheres of influence approach to international relations. It was late to the game to secure its own sphere, preoccupied with the Civil War and forging a nation. Its economic prowess by then had rivaled the UK and Germany. As a non-status quo power, the US offered an alternative way to organize the world. Instead of fixed spheres of interest, which often triggered wars when one sought a larger sphere, the US strategy was for for variable shares (of the world's GDP) that varied according to one's economic and financial acumen. This was called the Open Door and was codified and institutionalized after WWII in the GATT (now WTO), the IMF and the World Bank. US disengagement, if that is what the demise of TPP and the threat to withdraw from NAFTA entails, could see the return of spheres of influence, which is the approach that Russia and China have championed.